Ecuador had a tremendous increase of performance level from October to November 2015, all while Brazil had been going through a tough chain of bad luck in October, but slowly graduating till the March of 2016. Although they could not meet the peak of Ecuador’s success where they were flying high. Brazil’s brilliant set of footballers failed to perform their level best this season, which is nothing less than daggers through their hearts. Ecuador had the longest winning run amongst them, including a higher number of clean sheets, having had F. Caicedo as their Top scorer this year and J. Paredes as the Top Assist alongside him. Standing at 6th position in the South America zone and Brazil is at 3rd, the odds are to Brazil’s side as it seems. The match between Brazil vs Ecuador will kick off at 3:00, 1st September,2016 in Ecuador’s Estadio Olímpico Atahualpa (Quito). 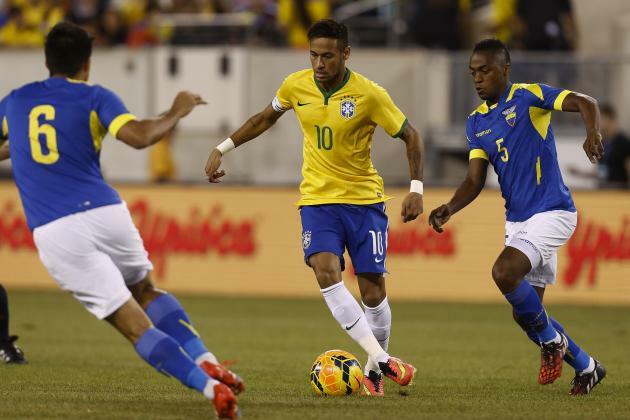 Brazil and Ecuador will play the first head to head among them in the world cup qualification of South America Zone. The last meeting of them were held on 2016 Copa America and there it was a draw by 0-0 goals. In the past decade Brazil has managed to get as close to fourth place in Fifa World Cup in 2014 since their 2002 Champions title. Both Brazil’s past Qualification matches against Uruguay and Paraguay ended in draws. Goalkeepers: Diego Alves (Valencia), Ederson ( Benfica) and Jefferson (Botafogo). Defenders: Rodrigo Caio (Sao Paulo), Fabinho (Monaco), Douglas Santos (Atlético Mineiro), Alex Sandro (Juventus), Gabriel Paulista (Arsenal), Jemerson (Monaco), Danilo (Real Madrid), Felipe (Porto), David Luiz (PSG) , Rafinha (Bayern Munich). Mid Fielders: Elias (Corinthians), Lucas Moura (Paris Saint-Germain), Ganso (Sevilla), Walace (Grêmio), Luiz Gustavo (Wolfsburg), Kaká (Orlando City), Rafinha(Barcelona), Douglas Costa (Bayern Munich), Oscar (Chelsea), Fernandinho (Manchester City), Felipe Anderson (Lazio), Alex Teixeira (Lazio). Forwards: Hulk (Shanghai SIPG), Jonas (Benfica), Ricardo Oliveira (Santos), Roberto Firmino (Liverpool), Luan (Grêmio). Máximo Banguera, Mario Pineida ,Frickson Erazo, Jorge Guagua, Oscar Bagui ,Norberto Araujo, Angel Mena, Juan Cazares ,Pedro Larrea, Segundo Castillo, Alex Bolanos, Junior Sornoza, Bryan Cabezas, Joao Joshimar Rojas, Jonathan Gonzales, Osbaldo Lastra, Joao Rojas, Jose Angulo, Walter Chala, Daniel Angulo, Juan Rojas.